Nearly half of new businesses reported a cyber breach or attack in the past 12 months. Cyber criminals are after your money, your data and your intellectual property. If you haven't taken steps to protect yourself and your business, take action now. At 360ict we strongly recommend to our clients to at least review this UK Government initiative. Why should small to medium businesses get Cyber Essentials? • Enable you to bid for Government contracts. 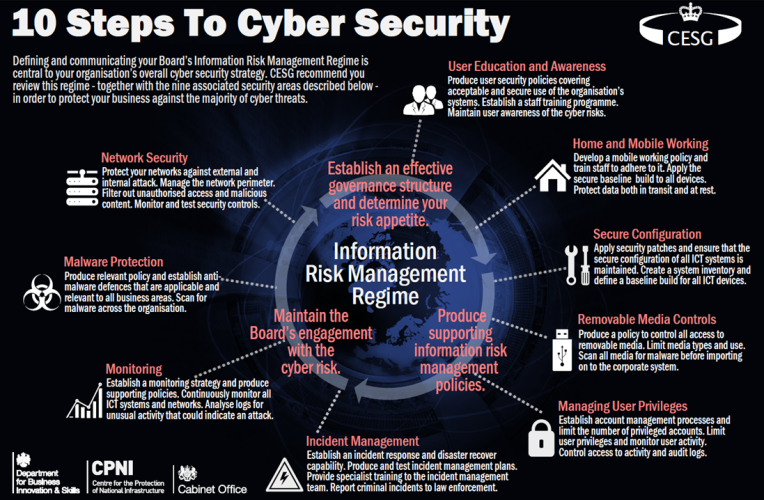 The Assurance Framework, leading to the awarding of Cyber Essentials and Cyber Essentials Plus certificates for organisations, has been designed in consultation with SMEs to be light-touch and achievable at low cost. The two certification options give organisations a choice over the level of assurance they wish to gain and the cost of doing so. Cyber Essentials and Cyber Essentials Plus. The Cyber Essentials certification process includes a self-assessment questionnaire (SAQ) and an external vulnerability scan that independently verifies your security status. Cyber Essentials Plus certification includes all the assessments for the Cyber Essentials certification but includes an additional internal scan and an on-site assessment. Whether or not you achieve certification to the scheme, these controls provide the basic level of protection that you need to implement in your organisation to protect it from the vast majority of cyber attacks, allowing you to focus on your core business objectives.